Cracks, dents or chips in the case. 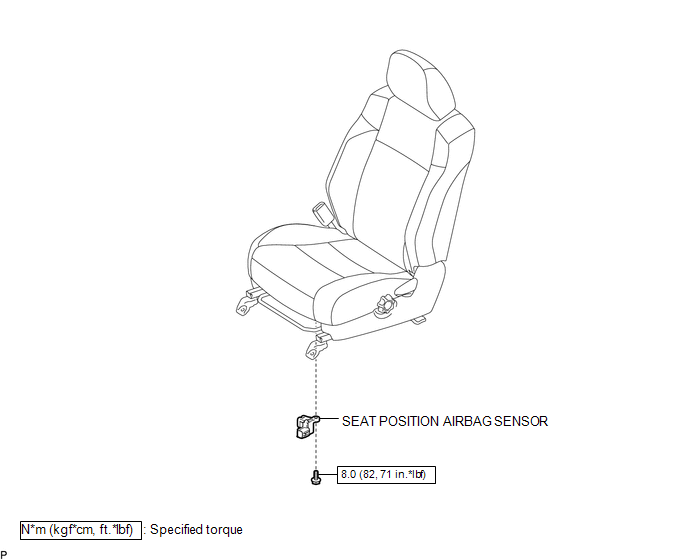 For removal and installation procedures of the seat position sensor, see pages and , and be sure to follow the correct procedure. (b) Check that the cable is disconnected from the battery negative (-) terminal. After disconnecting the cable from the terminal, wait for at least 90 seconds before starting the operation. Installation of the connector is done with the sensor assembly installed. Make sure the sensor assembly is installed to the specified torque. When installing the sensor assembly, make sure that the SRS wiring does not interfere with any other parts and is not pinched between other parts. After installation, shake the sensor assembly to check that it is not loose. 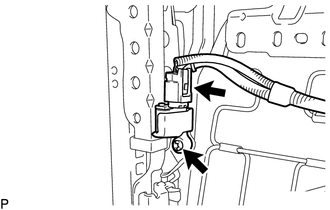 (c) Using a T30 "TORX" socket wrench, install the seat position airbag sensor with the screw. (d) Make sure that the clearance between the seat position sensor and the seat rail is within 0.6 mm (0.023 in.) and 2 mm (0.079 in.). (e) Check that there is no slack in the installation parts of the seat position sensor. (f) Connect the connector to the seat position sensor. (b) Using a T30 "TORX" socket wrench, remove the screw and seat position airbag sensor.